Fortunately, many species are adapting to these landscape changes and, with wildlife-friendly practices, are able to thrive on productive California farms and ranches. Farms like Davis Ranch. 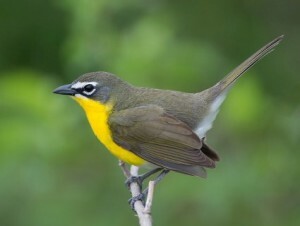 Restoration along the part of the property abutting the Sacramento River is sure to pay big dividends for birds like the yellow-breasted chat as the forest matures. Spanning thousands of acres, Davis Ranch has rice fields as far as the eye can see. It also produces tomatoes, walnuts and other crops. But the family owners have invested in more than just their crops. 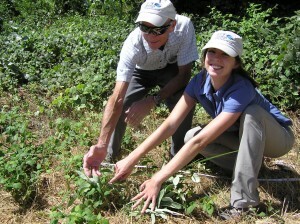 They are committed to farming in a way that contributes to the sustainability of both the local economy and environment. 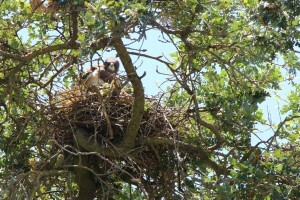 Davis Ranch has been home to several pairs of Swainson’s hawk for more than a decade, providing the birds with plentiful foraging opportunities by establishing hedgerows adjacent to rows of crops to create prey habitat, and preserving an ample supply of nesting trees around its fields. During a recent visit to Davis Ranch, I was pleased to see that these efforts have also paid off for several other riparian bird species. On the clear blue day, you could see and hear birds in every corner of the expansive property. Brian Halstead (left), a wildlife biologist from the U.S. Geological Survey, points out various habitat attributes for giant garter snake at Davis Ranch. I also saw a lot of prime giant garter snake habitat around the farm – not surprisingly, as U.S. Geological Survey scientists have been working in close cooperation with the landowners to monitor a robust snake population on and around Davis Ranch for over a decade. The farm has factored the snake into its farming practices by preserving vegetation along and within the ranch’s waterways to provide cover from the snake’s predators. Finally, I was pleasantly surprised to encounter a number of monarch butterflies fluttering about the property, which gave us an opportunity to discuss the conservation potential of managing for the monarch’s milkweed habitat at Davis Ranch as well. 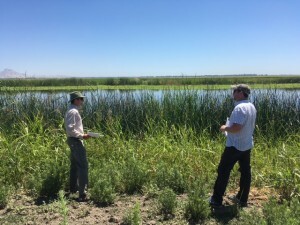 On my recent visit to Davis Ranch, I was joined by many colleagues and partners who have been working with me over the past several years to develop the Central Valley Habitat Exchange – an emerging conservation program that strives to create a future where landowners are compensated for sustainable management practices, like those on Davis Ranch. My EDF colleagues found a monarch caterpillar while counting milkweed stems at Davis Ranch. Read more about their work to develop a habitat quantification tool for monarchs here. Before farmers and ranchers can get paid for conserving and restoring habitat, we need to make sure that we are accurately measuring the habitat improvements. Our science team is now in the process of finalizing a habitat quantification tool that will do just that, giving us the ability to assign credit values to certain activities and direct payments to deliver the most conservation per dollar invested. While the presence of birds, snakes and butterflies on Davis Ranch is already proof that it is ably supporting them, the habitat quantification tool will offer insight as to whether other management practices could help even more. The hope is that this tool will ultimately be used to maximize the habitat outcomes of private lands throughout the Central Valley, putting California’s farms and ranches to work for wildlife. This entry was posted in ecosystems, Habitat Exchange, Sustainable Agriculture, Wildlife Protection and tagged agriculture, california, central valley, central valley habitat exchange, Davis Ranch, drought, environmental defense fund, giant garter snake, habitat exchange, monarch butterfly, rice farm, Swainson's hawk. Bookmark the permalink. Both comments and trackbacks are currently closed.